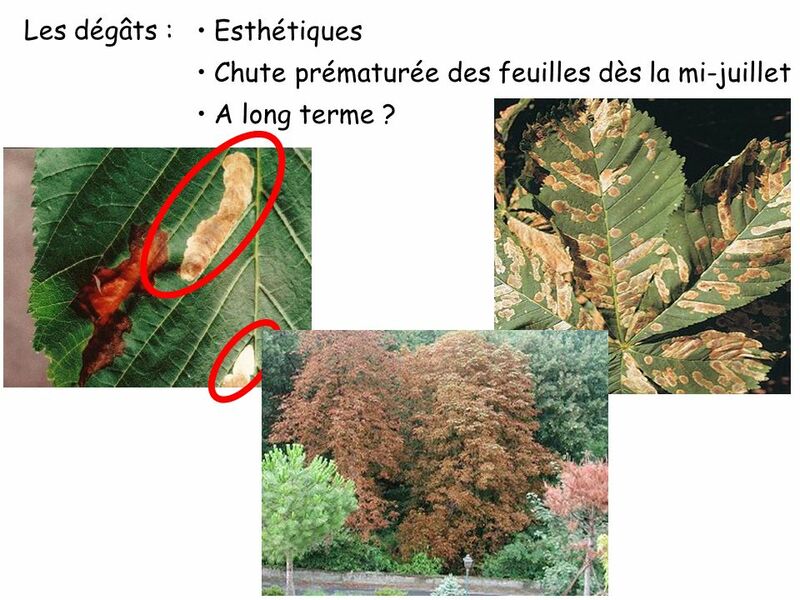 6 Les dégâts : Esthétiques Chute prématurée des feuilles dès la mi-juillet A long terme ? 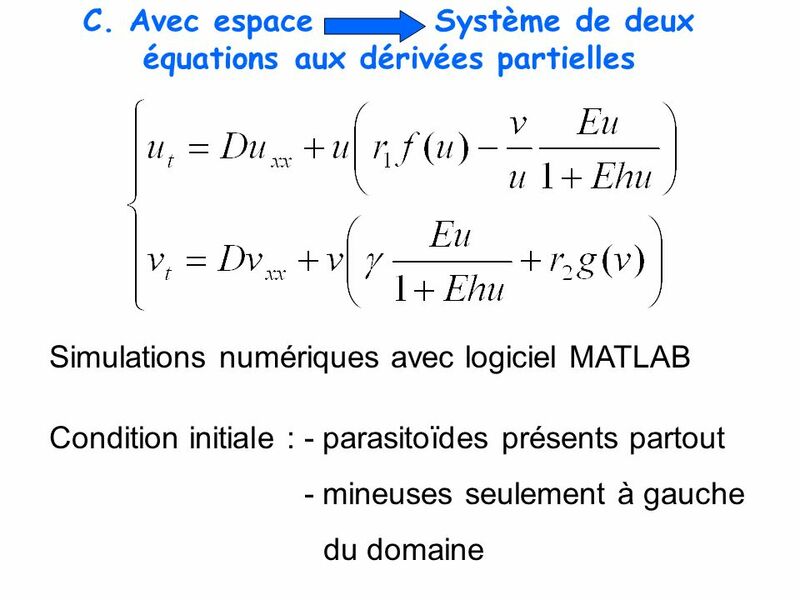 11 EQUATIONS This gives us 2 equations which were computed with MATLAB. 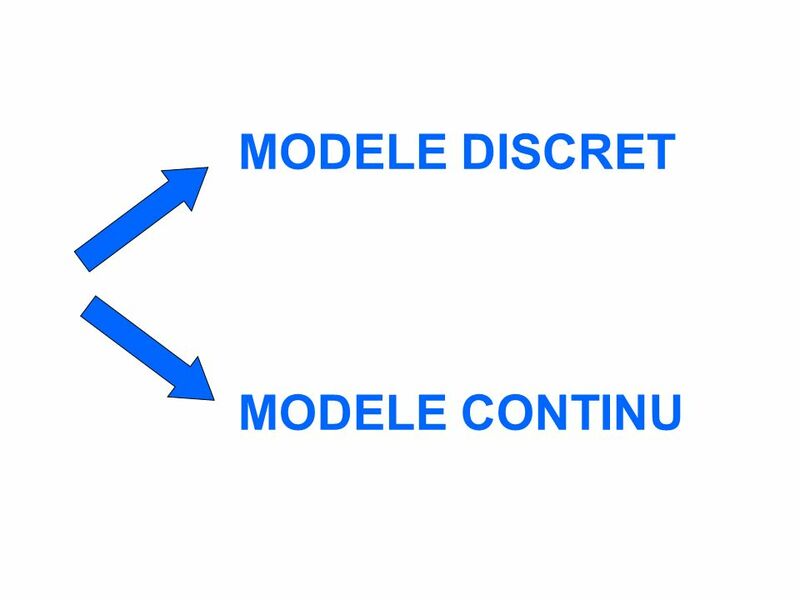 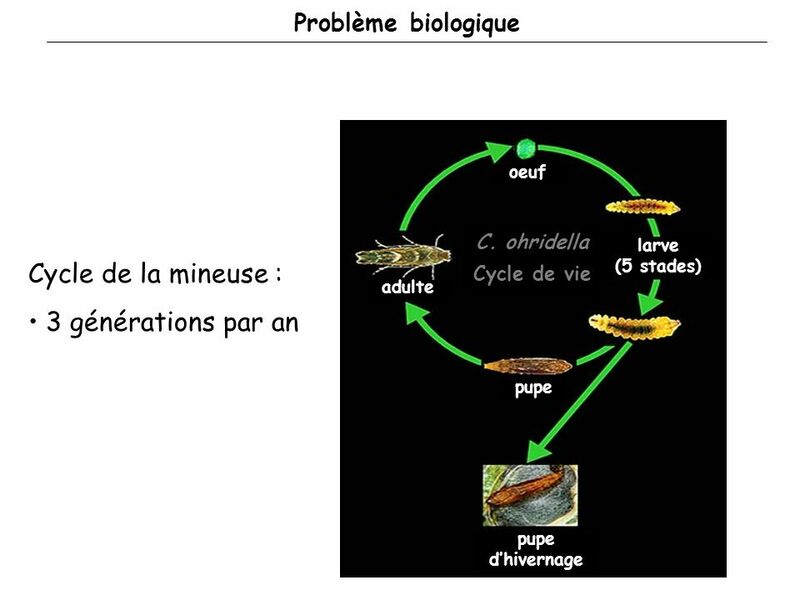 First, I will present the modeling of the problem with the biological hypotheses . 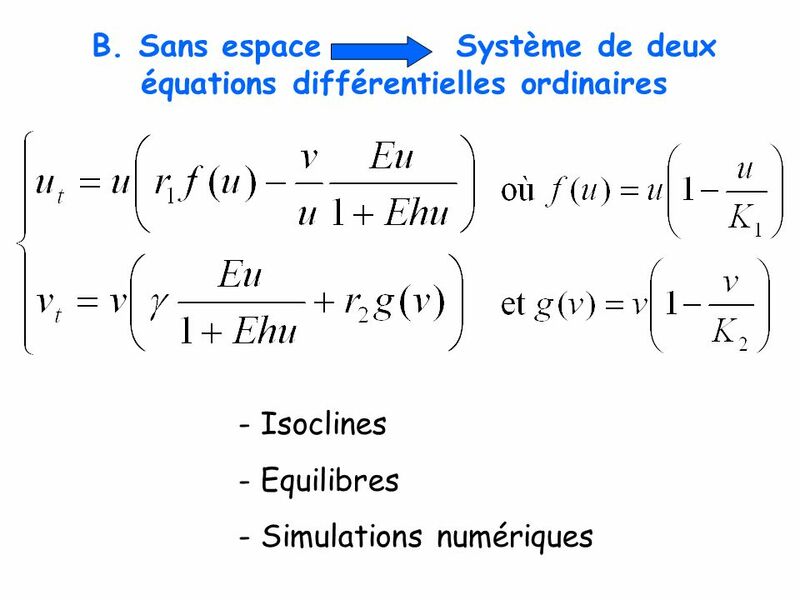 We start with the analyze of the associated Ordinary Differential Equations’ system. 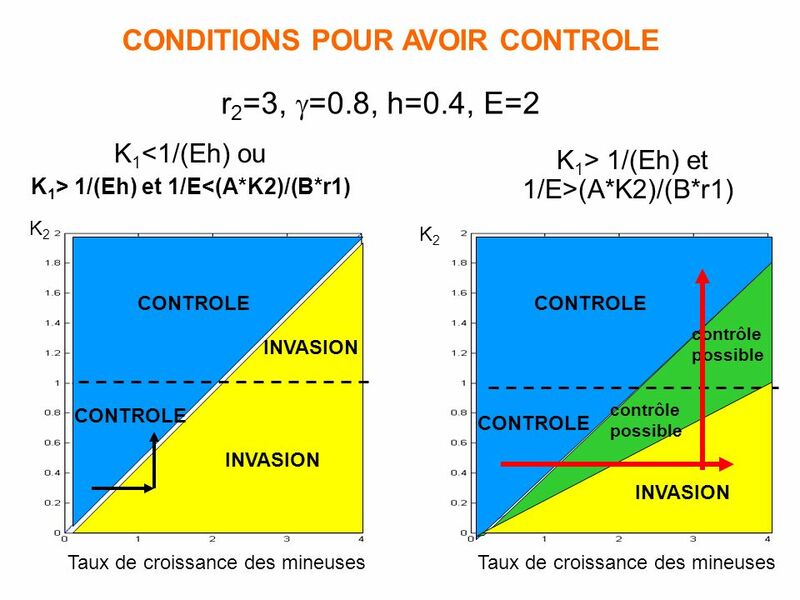 We will try to express the control’s condition in function of biological parameters. 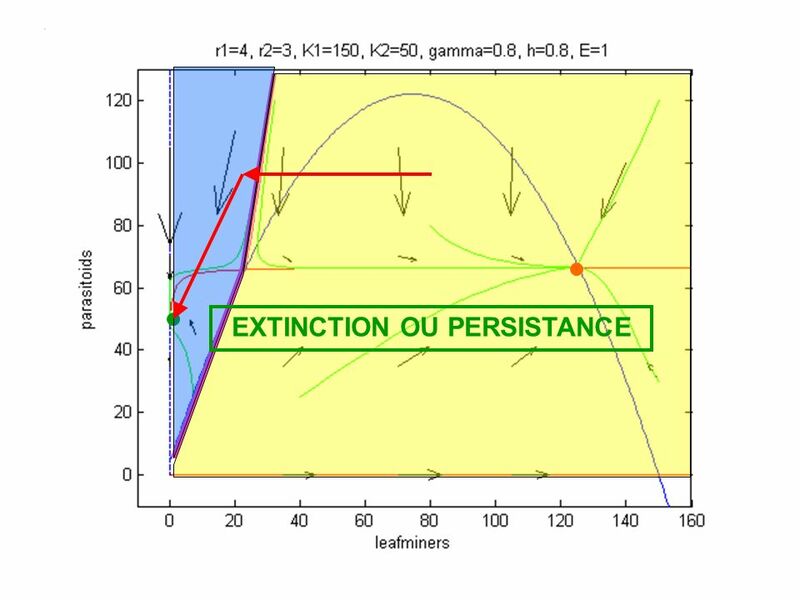 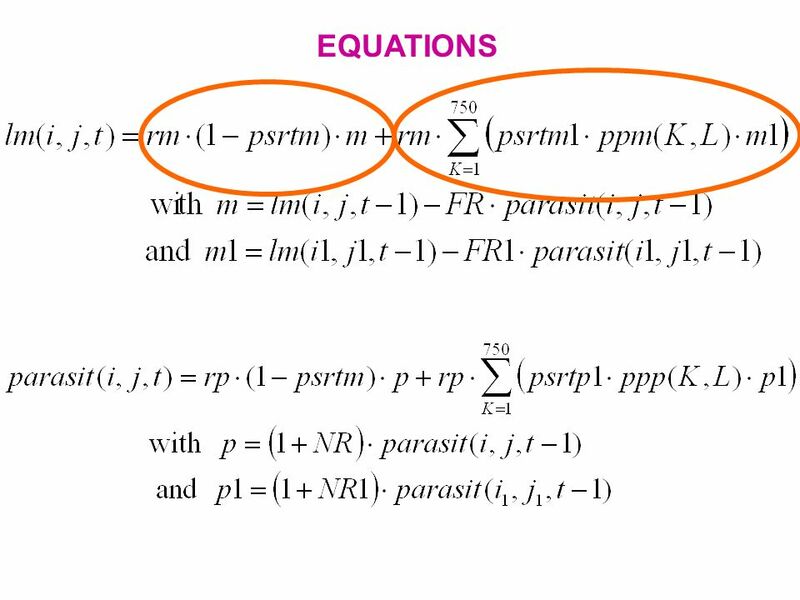 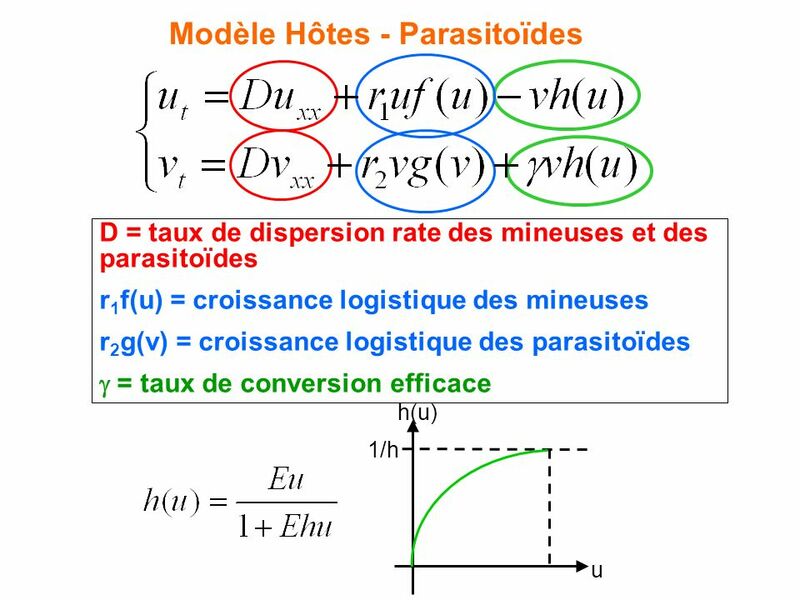 Then I present some numerical simulations of the Partial Differential Equations’ system, and we will see the effect o fthe dispersion rate on the invasion and the control of the leafminers. 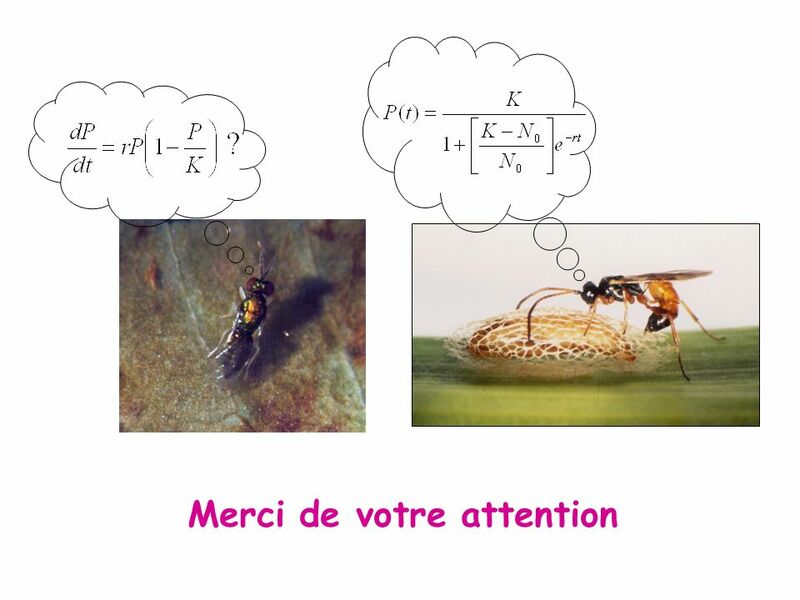 And to finish, the conclusion and some perspective. 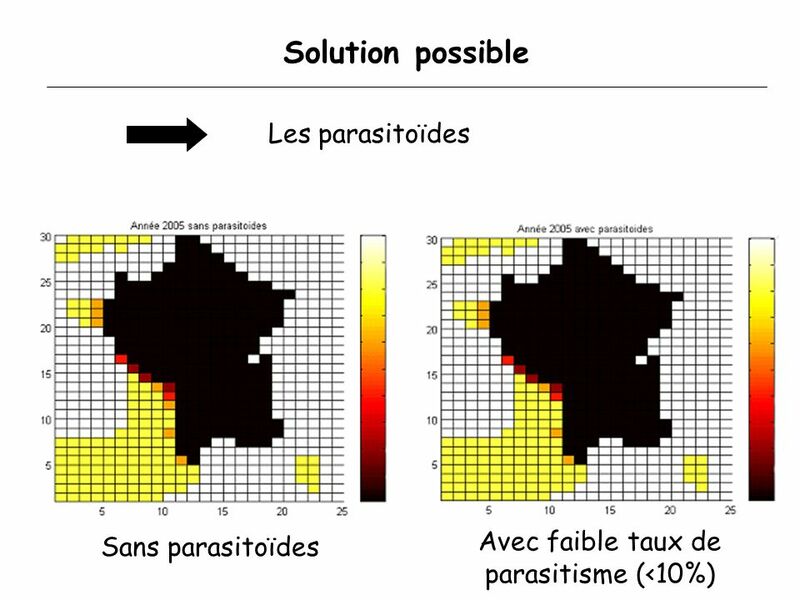 mineuses et parasitoïdes à croissance logistique taux de diffusion identique pour les mineuses et les parasitoïdes parasitoïdes sont des généralistes, et donc présents partout à leur capacité d’accueil The biological hypotheses are the following : For growth, leafminers and parasitoids follow a logistic growth The dispersion rates are the same for parasitoids and leafminers The functional response is of Holling type 2. 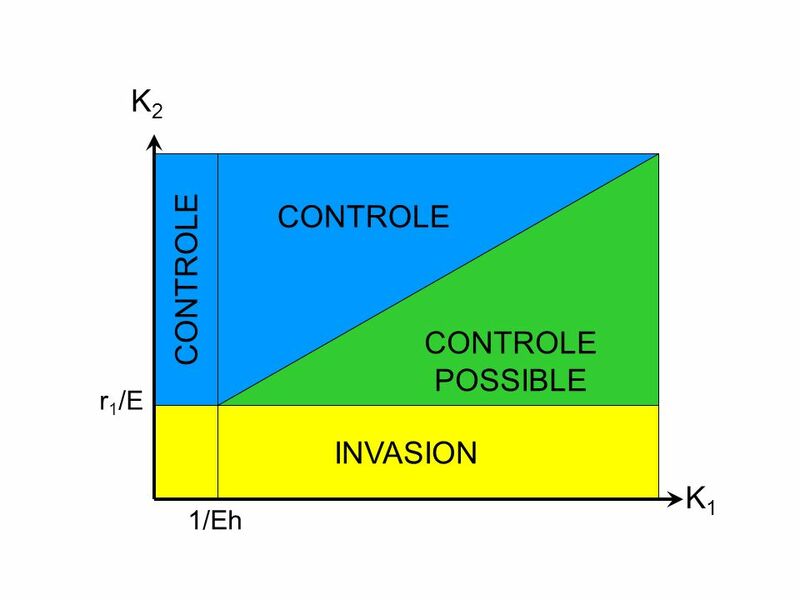 The original hypotheses is that parasitoids are generalist, so it can survive on other leafminers than the focal host and a consequence of this is that they are present everywhere before the invasion of leafminers. 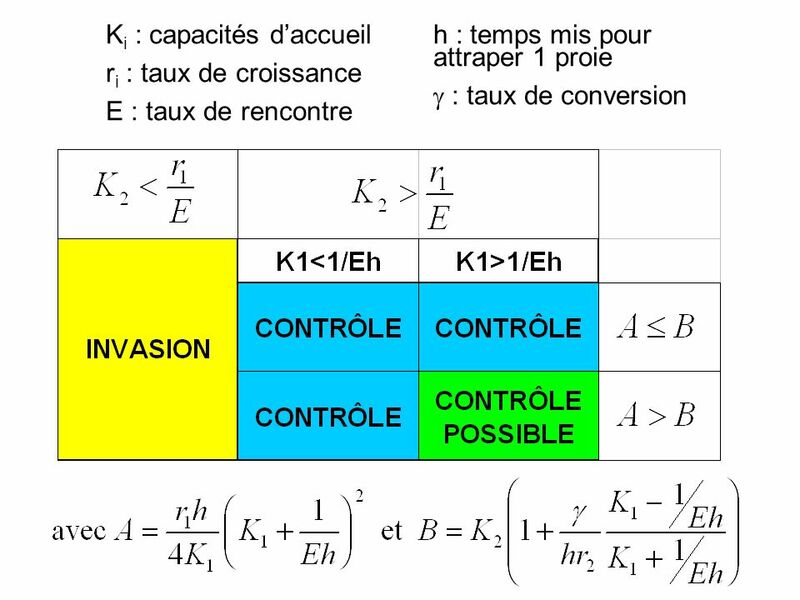 (r1h/4K1)(K1+1/Eh)2 r1/E K1>1/Eh K1<1/Eh u v K2(g/(r2h)+1) K2 To answer to this question we have to analyze our system. 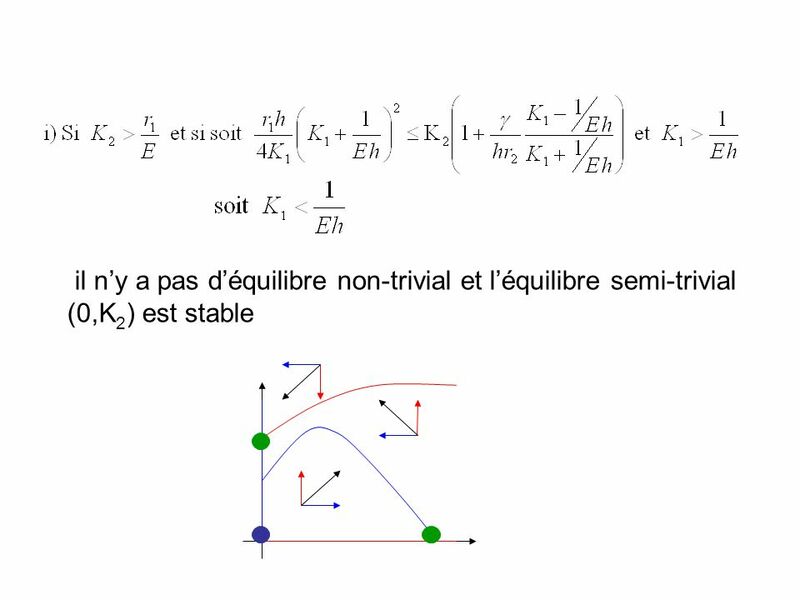 We start by the nullclines and the equilibriums. 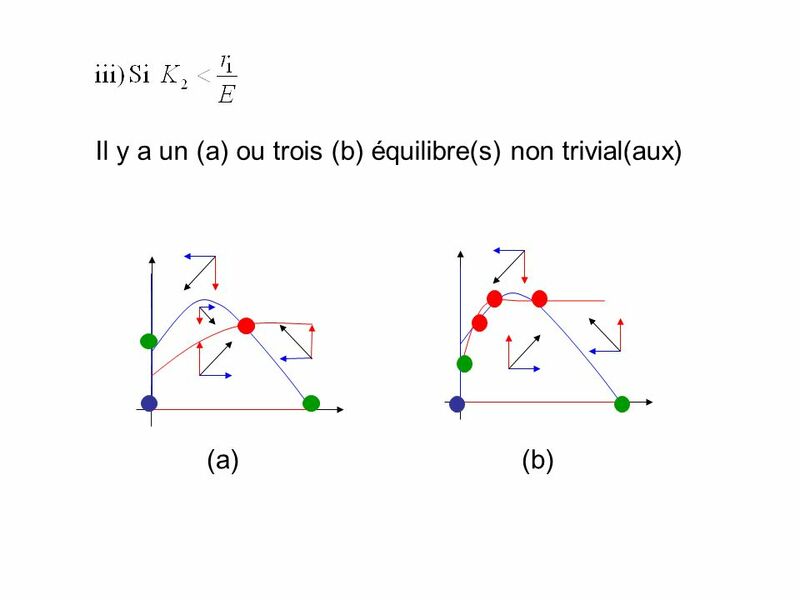 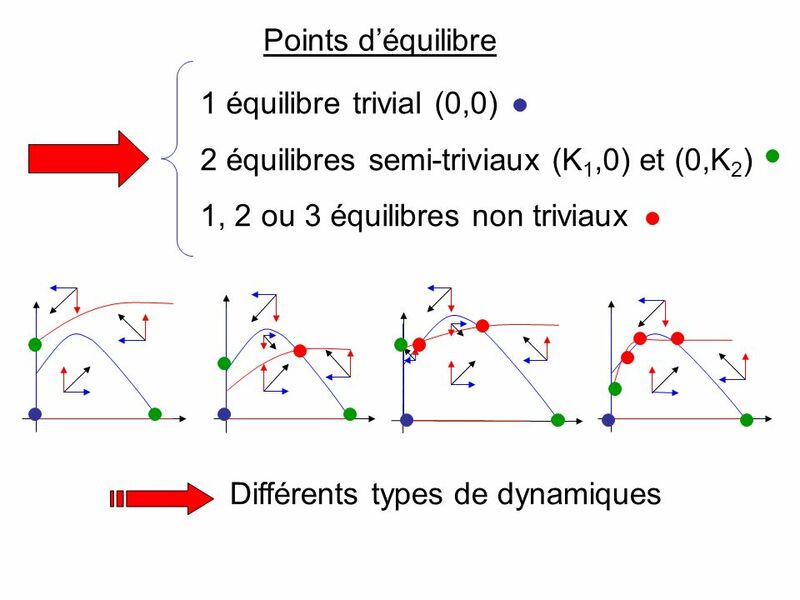 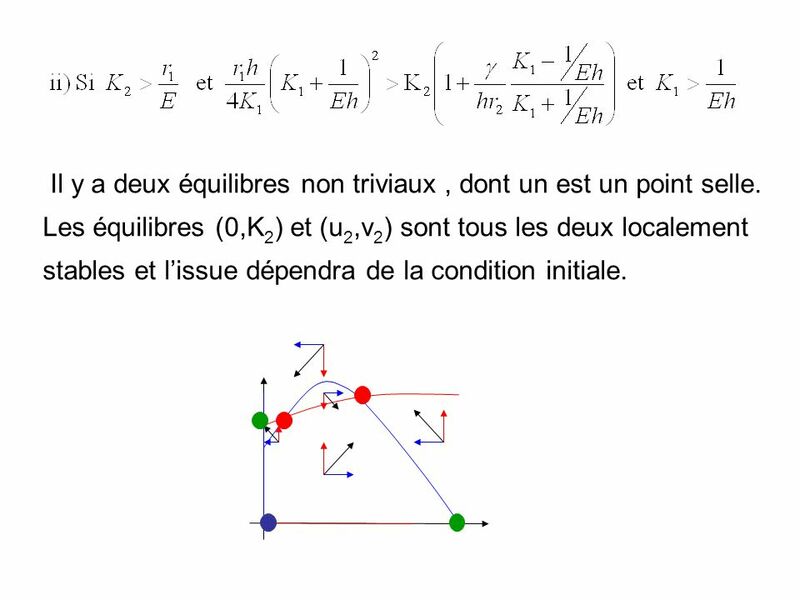 27 Il y a deux équilibres non triviaux , dont un est un point selle. 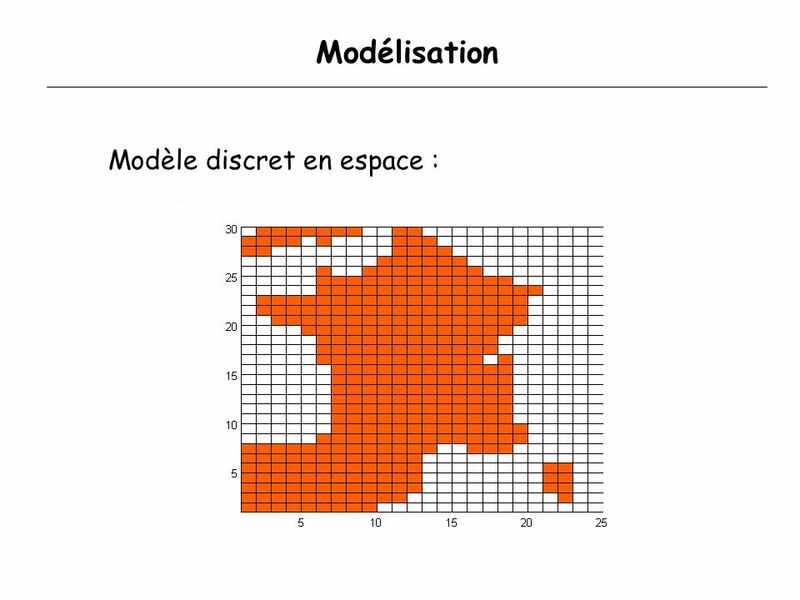 Les équilibres (0,K2) et (u2,v2) sont tous les deux localement stables et l’issue dépendra de la condition initiale. 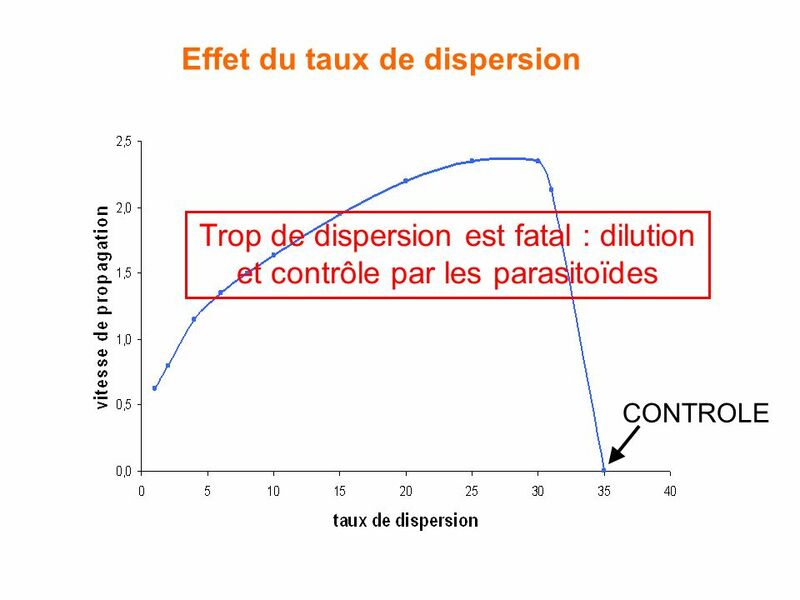 In this first graph there is eradication of leafminers, Here there in invasion, parasitoids couldn’t control the leafminers. 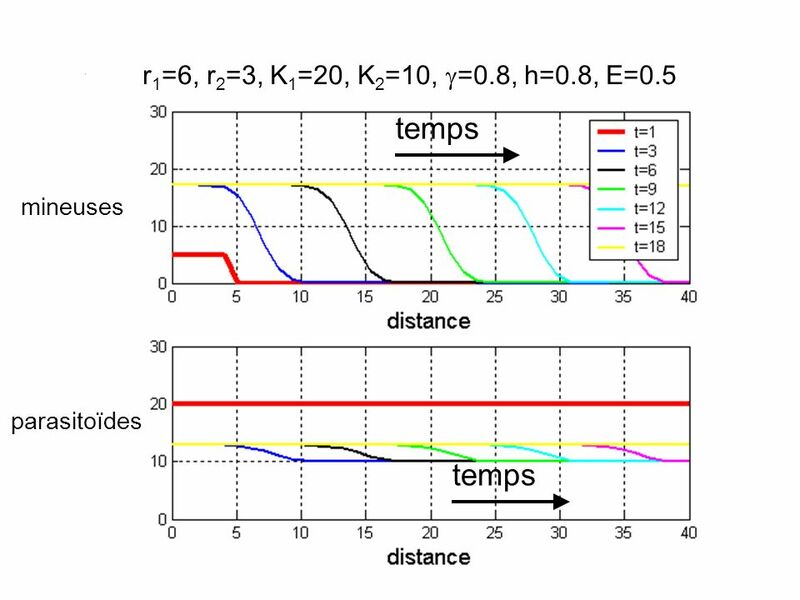 In this last graph, the issue depends on the initial conditions. 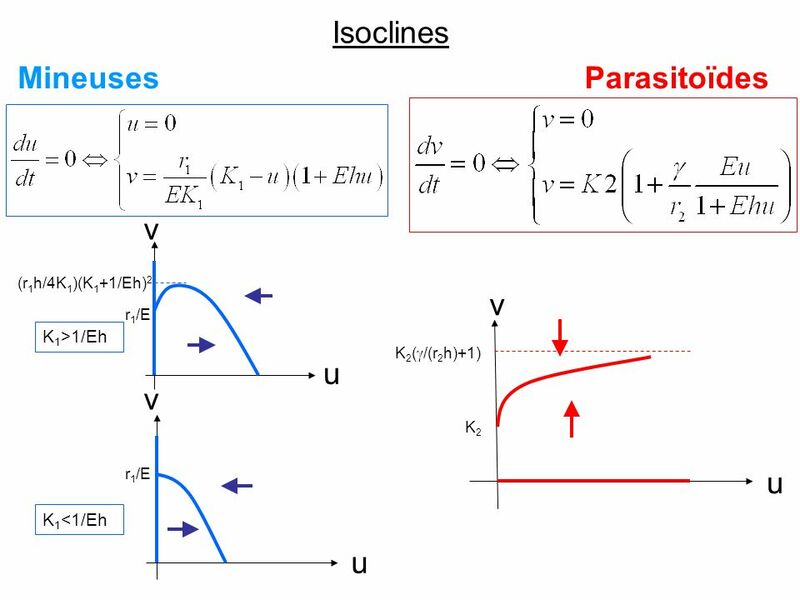 So if we have an other control method to make the leafminers density decrease, then parasitoids could control them. 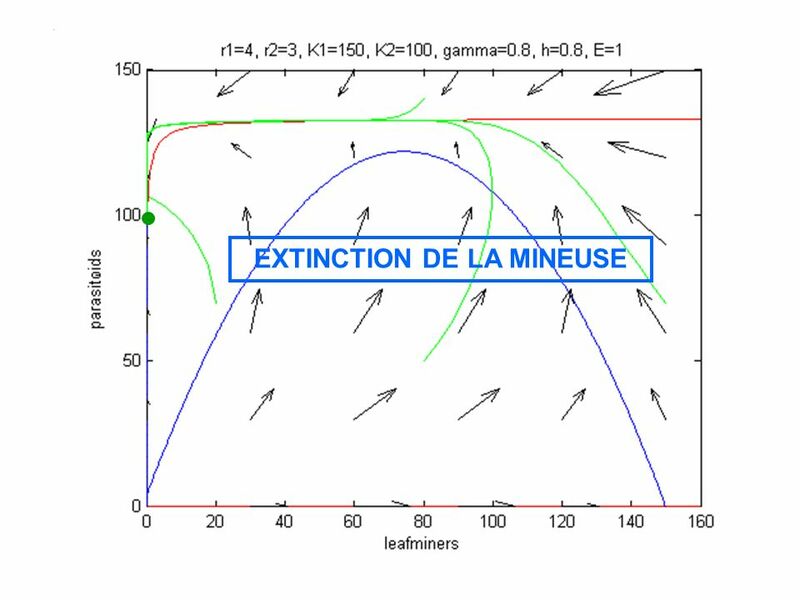 h : temps mis pour attraper 1 proie g : taux de conversion The issue of the predation could be express in function of the biological parameters. 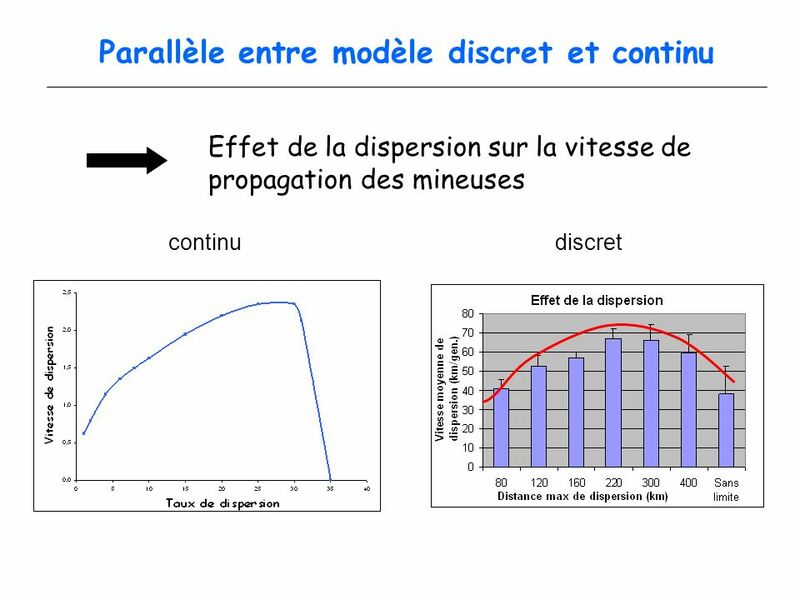 K1 is the carrying capacity of ….. We have represented this table with graphs. 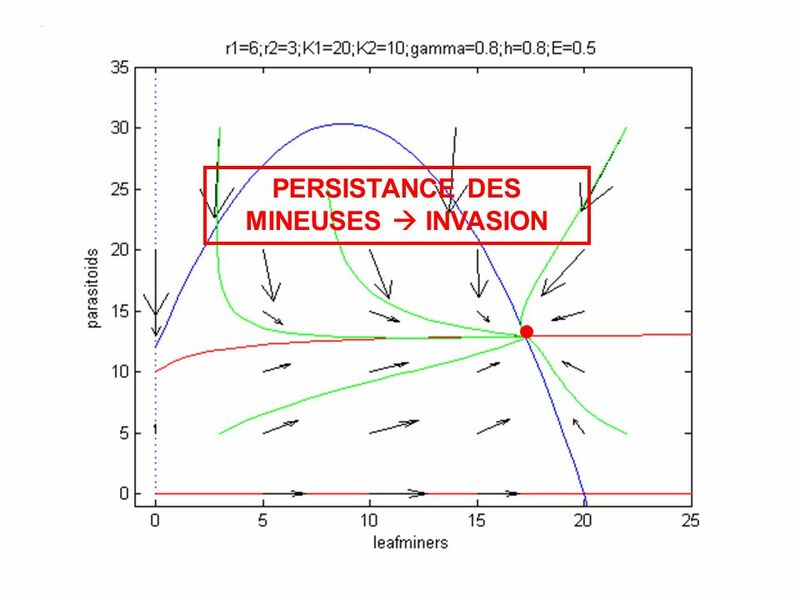 Simulations numériques avec logiciel MATLAB Condition initiale : - parasitoïdes présents partout - mineuses seulement à gauche du domaine Now we consider the PDE system with dispersion. 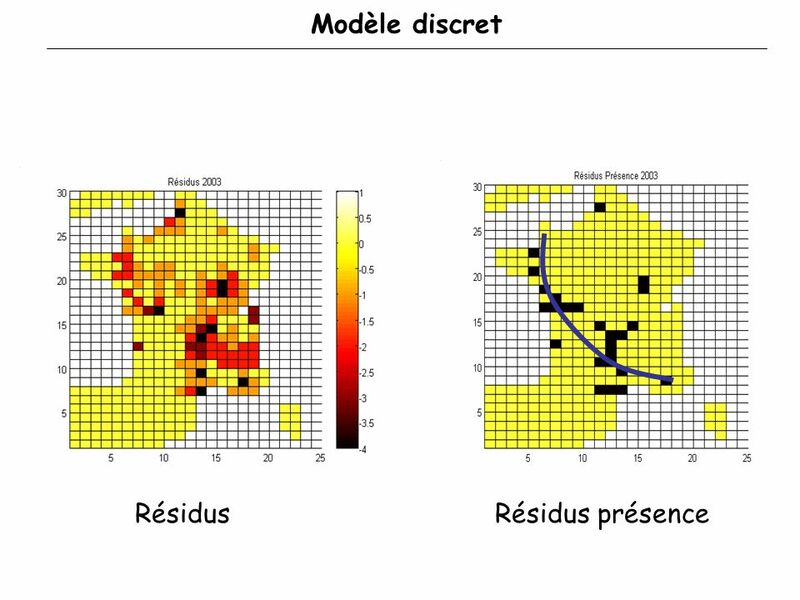 We have made some numerical simulations with the software Matlab. 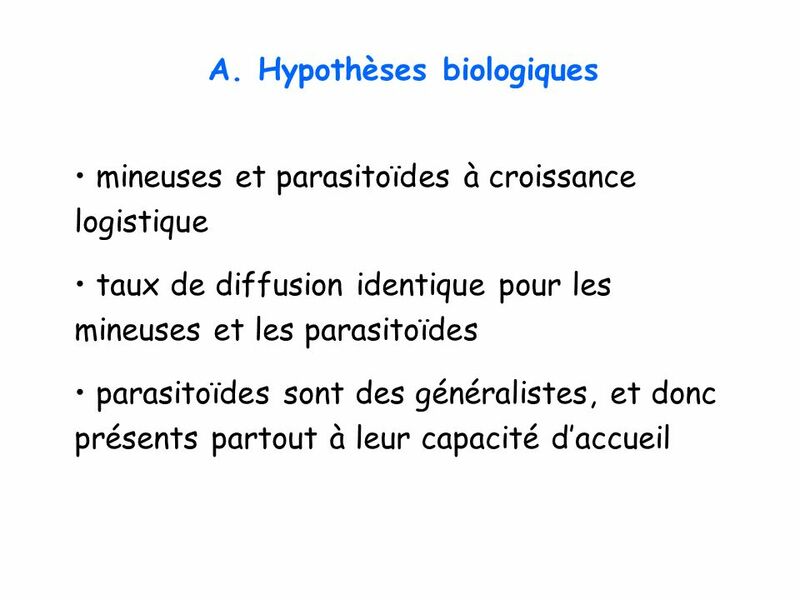 The initial condition is the following. 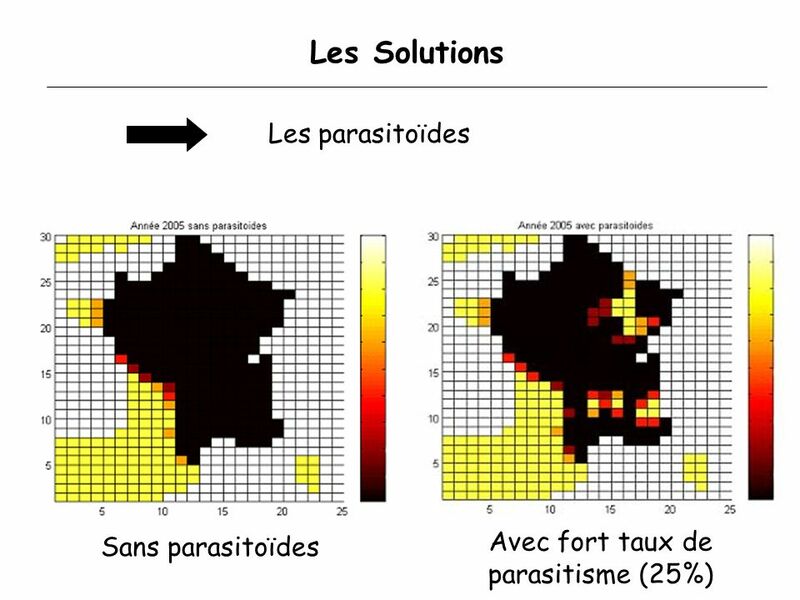 Parasioids are present everywhere while leafminers arrive from the left. 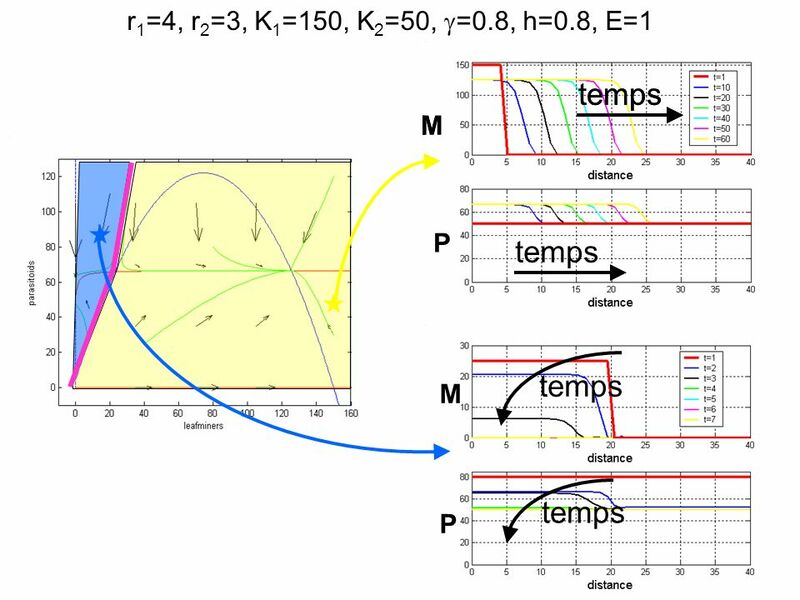 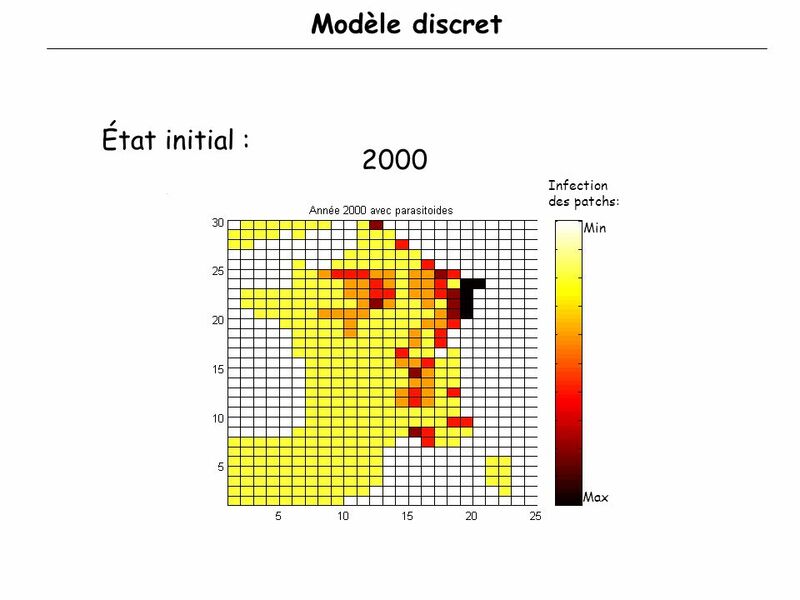 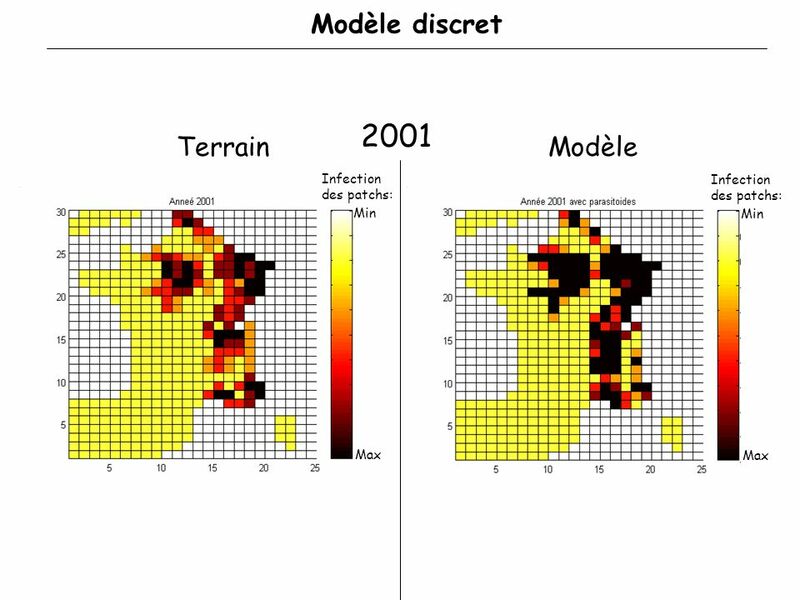 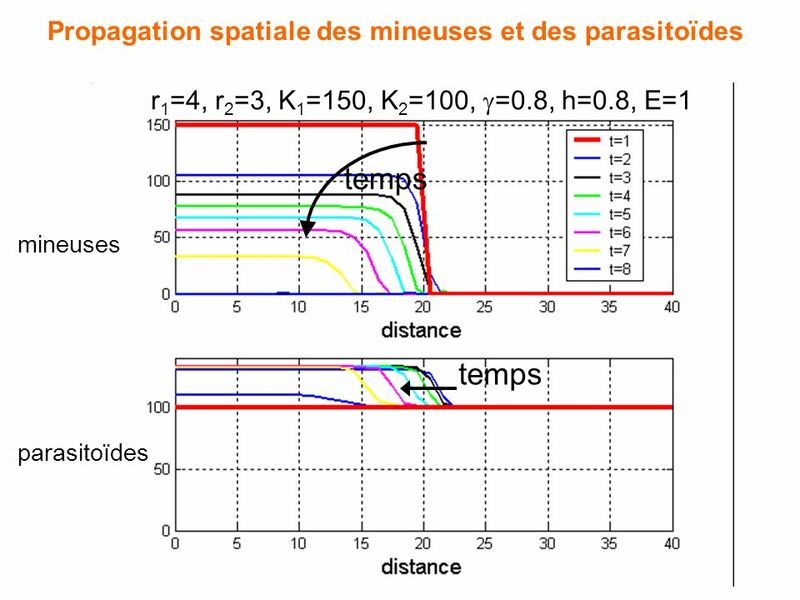 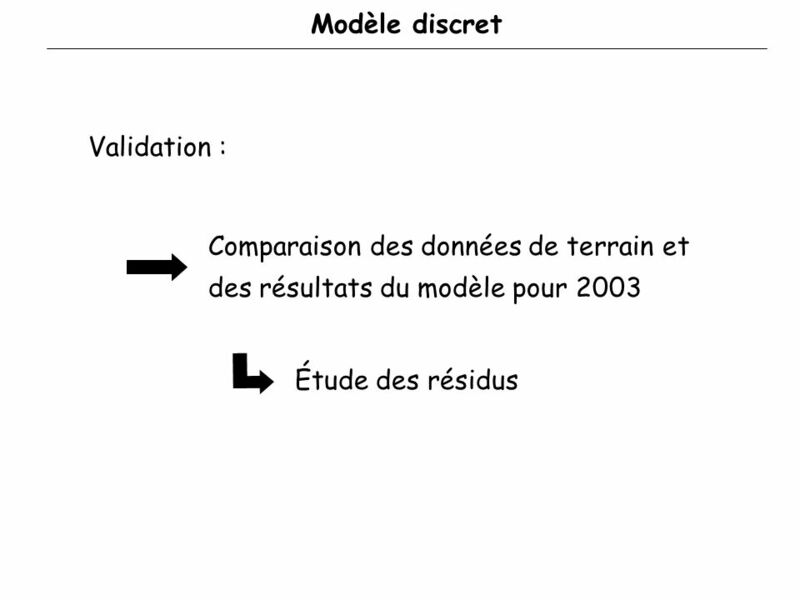 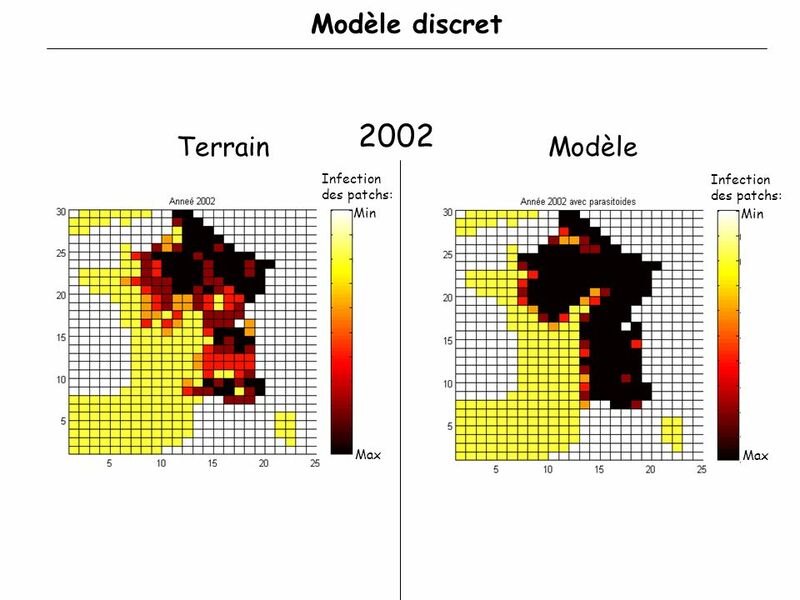 Télécharger ppt "PROPAGATION SPATIO-TEMPORELLE D’UNE MINEUSE ET DE SES PARASITOIDES"
WP4: Estimation des mouvements du sol par approche empirique (Nice et Grenoble) WP3: Estimation des mouvements du sol par approche déterministe Réunion. 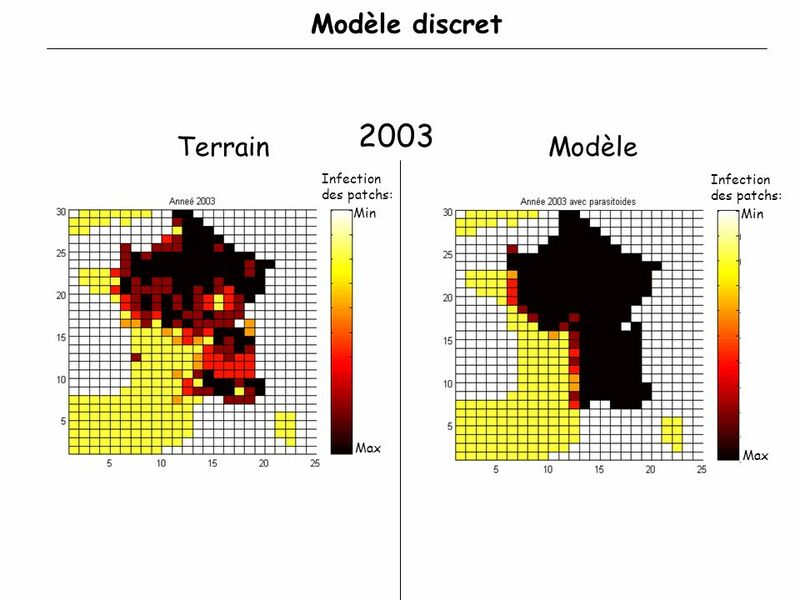 Protection biologique des espaces verts et des arbres urbains. 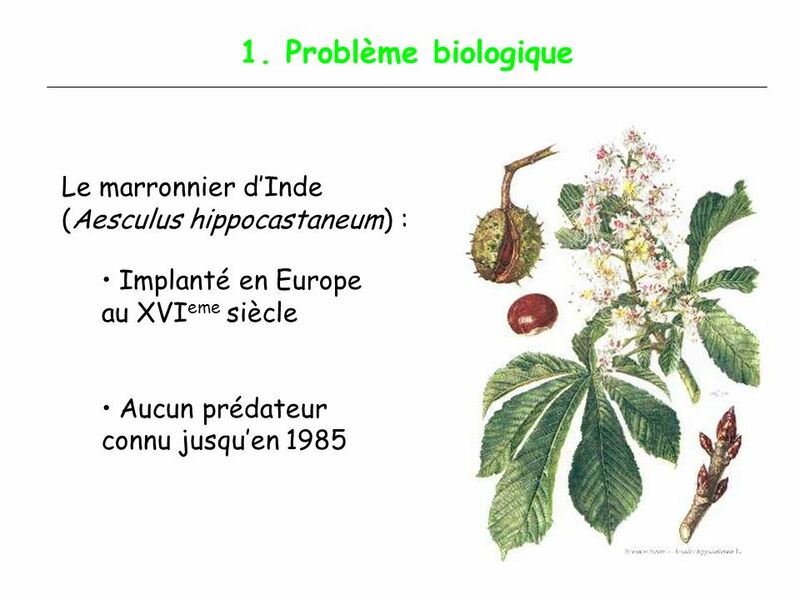 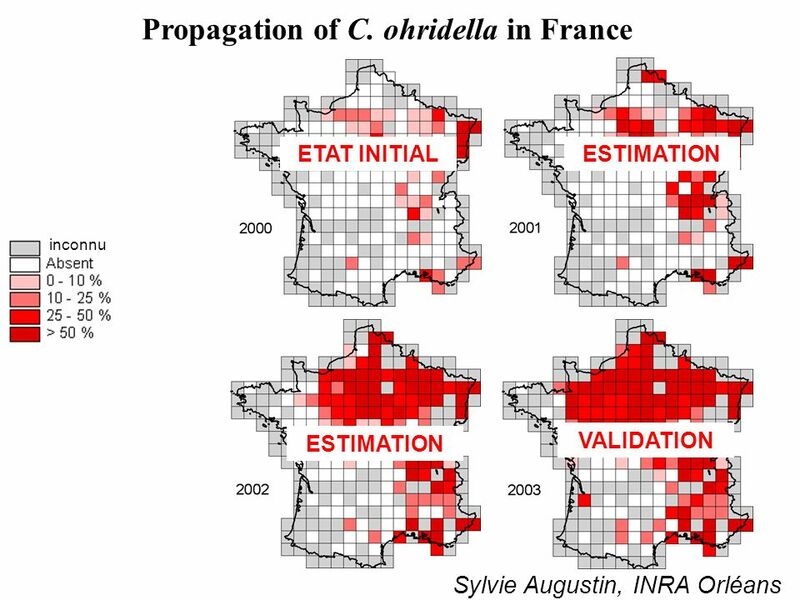 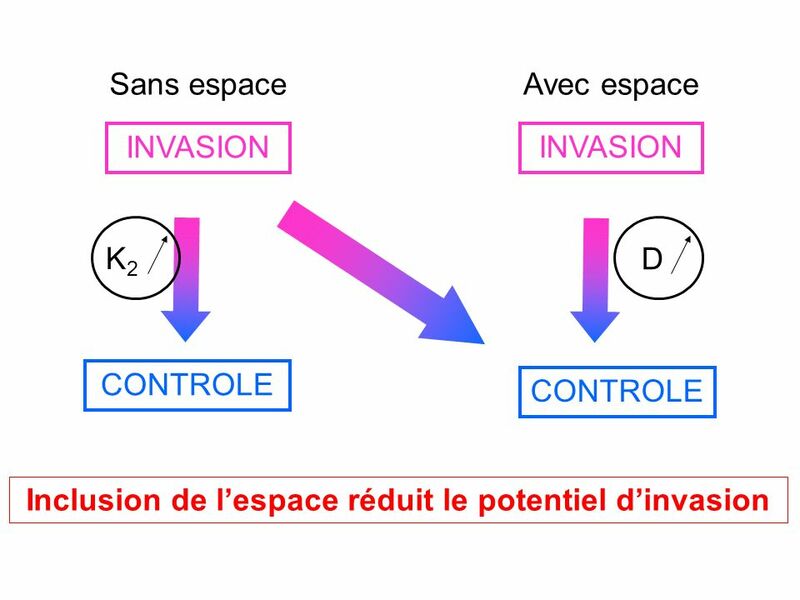 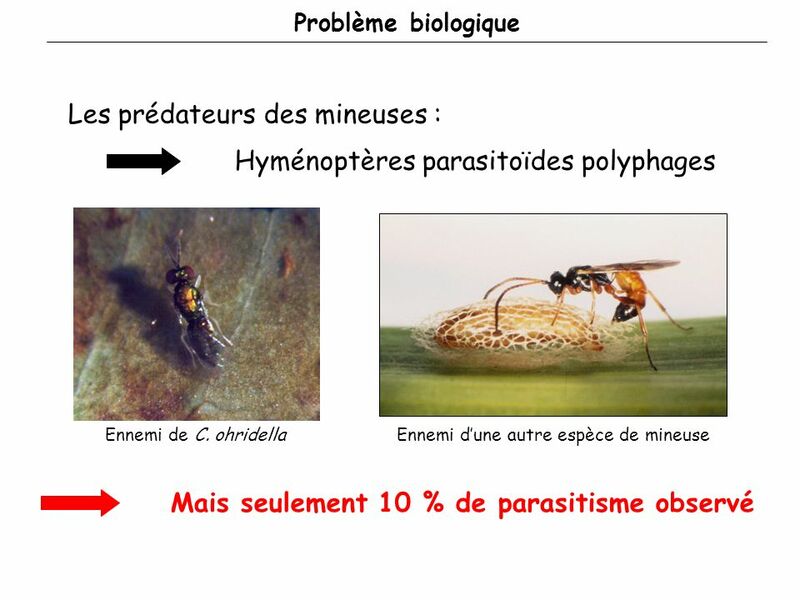 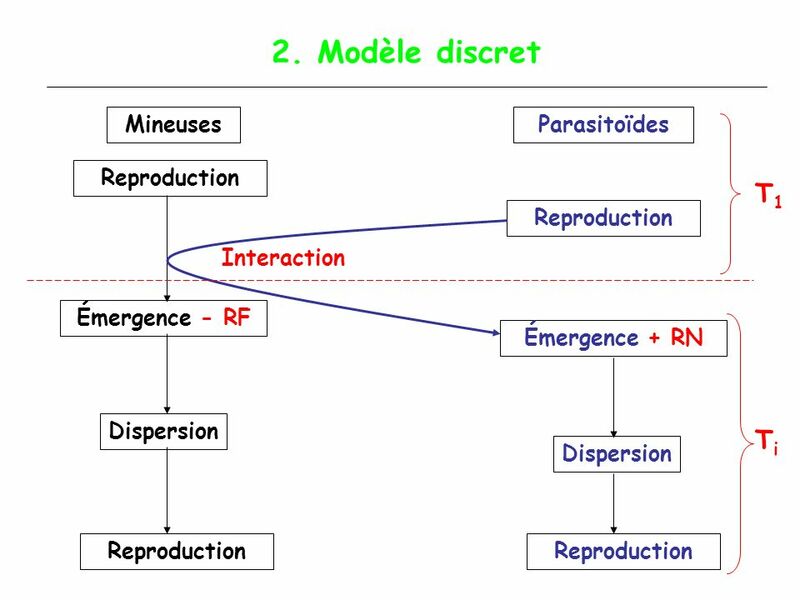 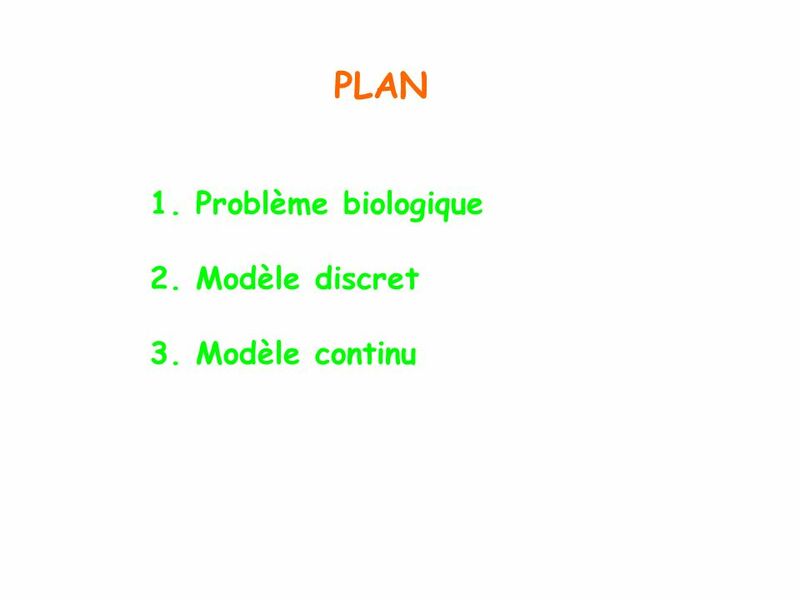 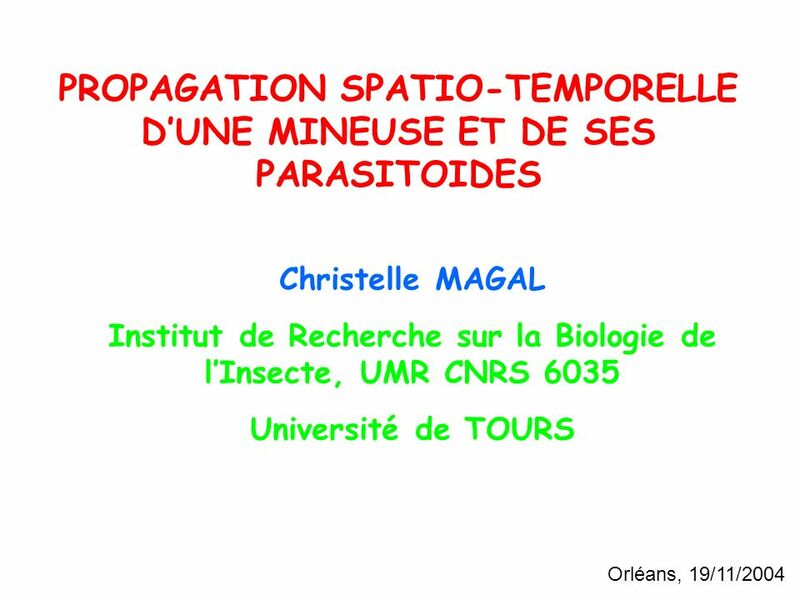 Apprendre ou ne pas apprendre: simulation du comportement dun insecte parasitoide (Trisolcus basalis) P. Coquillard (UNSA), E. Wajnberg (INRA), G. Dauphin. 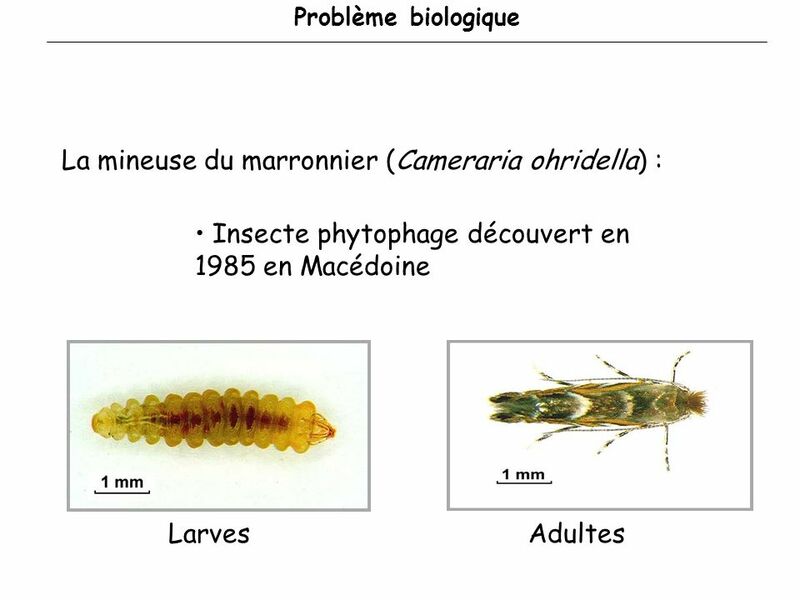 Utilisation de lordinateur dans un enseignement de premier cycle Jacques Raynauld École des Hautes Études Commerciales.